This post is for Watery Wednesday. 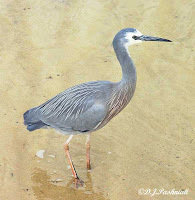 These birds are very difficult to get close to in my area but down on the Noosa River they are much less wary. This one came walking over to see if we had any fish scraps it could take. Later we watched a fisherman come in and pull his boat up on the bank. As soon as he turned his back this White-faced Heron hopped right into the boat and began looking for any scraps on the bottom of the boat. It only moved off when the fisherman came right back to his boat. I moved away and then came in from a different angle. With the sun behind me I hoped to get some closer photos but there were too many people around. Double-banded Plovers breed on braided river channels in South New Zealand and spend the winter here in Eastern Australia. When the person walking down beside the water got too close they flew off. As they lifted off I got a couple of blurred photos of some in flight. When I have disturbed them before they have just run off and I do not remember seeing them in flight up close like this. The wings seem so small to take them on a return journey from New Zealand to Australia every year. 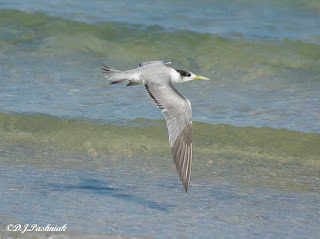 I love watching Terns flying over the ocean. I keep taking more photos hoping some day to catch the perfect moment! Watery Wednesday seemed like a good excuse to post another photo of one. 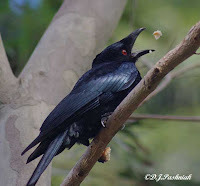 I went out with the Gympie Field Naturalists Club on Sunday for an outing to Poona. Poona is on the bay north of here and looks directly over to Fraser Island. We went for a wildflower walk in the morning and some of us looked for birds at the same time. We then went down to the picnic area right on the bay to sit and enjoy our lunch. The tide was out. I took photos and then came back to the same place a few hours later and took photos again with most of the sand flats covered by the incoming tide. Quite a difference! Looking SE directly out to Inskip point and the channel out to sea. I was looking at the far view and forgot about getting the Silver Gull in the close view in focus. This sign is placed prominently beside the boat ramp. 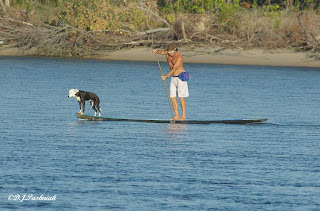 Similar signs have been put in a number of places since a large crocodile was sighted over from here on Fraser Island. Up until that time most people thought that crocodiles were not this far south. Now I'm wondering how much I should change my kayaking and shorebird watching habits? As soon as the local birds saw all these people sitting and eating they quickly came over and started looking for scraps. Some folks couldn't resist tossing out a few bits and I caught this Spangled Drongo both holding a piece with its 'foot' and also catching a piece in its beak. In the afternoon we went off to another site where there is a well-made walk of 1.8kms that takes a circle around a piece of land that has a mangrove tidal flat on one side and a paperbark swamp on the other. The birds were much more visible here than they had been in the morning and I got a photo of a male Rufous Whistler - a new bird for me. I also got clear photos of a Silvereye. I had seen these birds before but never managed a clear photo. A very good day! Nice company and good birds! 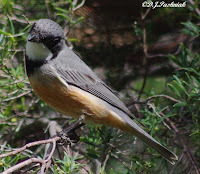 This handsome bird was sitting high in a tree close to the car park at Mullens Creek picnic area yesterday. A pair have nested in this area for many years now. Maybe they are planning to do so again this year. I shall have to go down and check the nest site more often. It was a beautiful morning - bright sunshine, crisp air, and the whole bay to myself - except for the birds. A large bird flying along the edge of the water caught my attention and the first photos I shot showed me a Black-necked Stork. It settled down in the water near some Little Egrets which looked very small by comparison. I walked out across the sand flats to get as close as possible but the bird only let me get about half way out before it took off and flew towards the other side of the bay. Even the closest photos I took were nowhere near as close and beautiful as those posted by bloggers further up north but they made my morning. 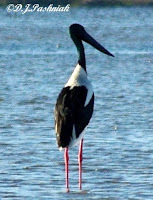 We seldom see Black-necked Stork here. I have only seen three in the six years I have been here. Click on the photos to enlarge them and see how beautiful the bird looked at the edge of the bay. I was out photographing LBJ's the other day when this one perched high up in a rather open casuarina tree. It was only when I got home and put the photos up on the computer screen that I realized I had another photo of a bird I had not previously seen - this time a female Mistletoebird. 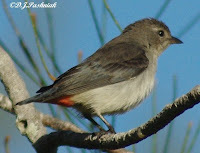 Apart from the red undertail coverts it is indeed another Little Brown Bird. 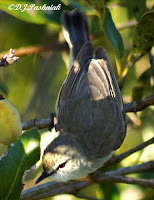 These birds eat the fruits of mistletoe plants as well as nectar, insects, and other fruit/berries. But! Uh-oh! I had read that these birds excrete the seeds of the mistletoe plants as a sticky 'package' - but I had certainly not expected to photograph this! That looks as if it would stick to anything! This photo is taken looking east out to the open sea. The entrance to the channel is still a long way out but already the boats are hitting quite big swells. Early Morning Beside the Bay. Yesterday morning was nearly perfect. The sun was shining and the wind had dropped. I was walking along the southern end of the saltmarsh where last time I had found numbers of small birds feeding. 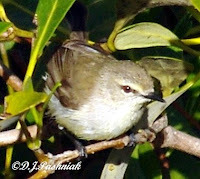 There wasn't so much blossom out yesterday but I could still see numbers of small honeyeaters in the tops of the trees. Then I came upon a small group of "little brown birds" busily feeding on insects in one of the mangrove trees that edge the bush. 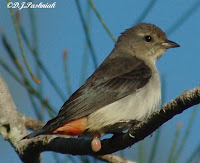 I have had brief glimpses of similar "LBB's" before but never long enough to either ID them or to take photos. This time they stayed in the bushes and busily flew in and out. The occasional bird came out to the edge of the leaves and I could take some quick photos before it would quickly fly off again. All the time they were making soft chattering contact calls. The photos were clear enough that I could send them off to a friend and get an ID when I got home. They were Mangrove Gerygones - a bird I have heard before but never been close enough to ID. Photos of a new bird for me definitely made this a great morning! 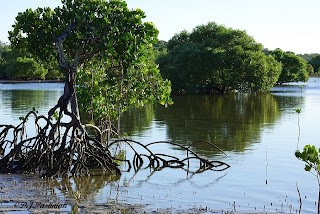 Mangroves are trees that grow at the edge of the sea and like to have their 'feet' in the water for at least some of the time. 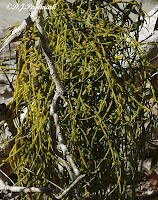 Some mangroves grow into tall trees and some stay as small shrubs. The different root systems are seen when the tide is low. This one has stilts at the base of its trunk. It will eventually grow lots taller. It's called a Red Mangrove. 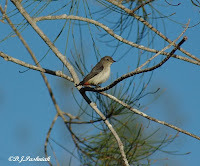 These birds are very common around my yard and since they are also very noisy they really can't be ignored. With their bare black head and strange knob on the bill they really can't be confused with any other bird. The feathers under the chin are rather beautiful when they put back their head and start their very noisy call. Thanks Larry for finding a good recording of the bird's call HERE. It's rather exciting when you wait over five years for a flower and it finally appears! A friend gave me this plant. She had it in a pot and it looked to have at least a year's growth on it then. So I guess the plant must be at least 6 years old. The flower spike has been slowly growing for months and it has taken ages for it to finally open. The spike is not fully open even now but I am not sure how much more it will open in the Queensland winter. The Gymea Lily (Doryanthes escelsa) grows naturally in open forest and woodland along the New South Wales Coast around Sydney and Newcastle. It makes a splendid specimen plant in a garden and can be bought from nurseries and garden shops. The plant keeps growing after the flower spike dies and I am told that the next flower will be even larger. In ideal conditions the spike can grow up to 6 meters tall. The base of the plant - this also will grow larger. The plant showing the flower spike extending up above the surrounding trees and palms. Gymea lilies have pleasant memories for me. We lived in Newcastle when I was in my teens and my Father showed me this flower growing in the bush. He called it a 'Mountain Lily'. Although it is sometimes called a 'Giant Lily' I cannot find Dad's name for it in the references I consulted. 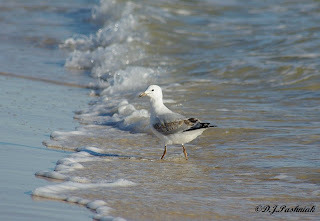 This juvenile Silver Gull has just been caught by the wave - and my camera!